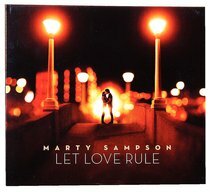 Known best for his Hillsong worship numbers, Marty Sampson turns his talents towards the love song in the 8 tracks on LET LOVE RULE. Christian love songs? You bet! Marty shows that real romance has got everything to do with God. Music Manager's View: The first solo project from Marty Sampson, one of the most recognised worship leaders in the world today. Prepare to be surprised - I had not anticipated how musically diverse these songs would be. They really showcase Marty's extraordinary skill and versatility. This is a unique album from a great Australian talent.